The news cycle hasn't been positive lately for both the Xiaomi Mi A1 and the Xiaomi Mi A2. The pair of Android One handsets have nearly a stock Android UI (no MIUI), with just a smattering of Xiaomi apps pre-installed. The Mi A1 launched a bit over a year ago, with a 5.5-inch LCD display carrying a 1080 x 1920 resolution (the traditional 16:9 aspect ratio). The Snapdragon 625 SoC powers the device, which features 4GB of RAM and 64GB of native storage. It seems that the Xiaomi Mi A1 is a hot phone, literally. 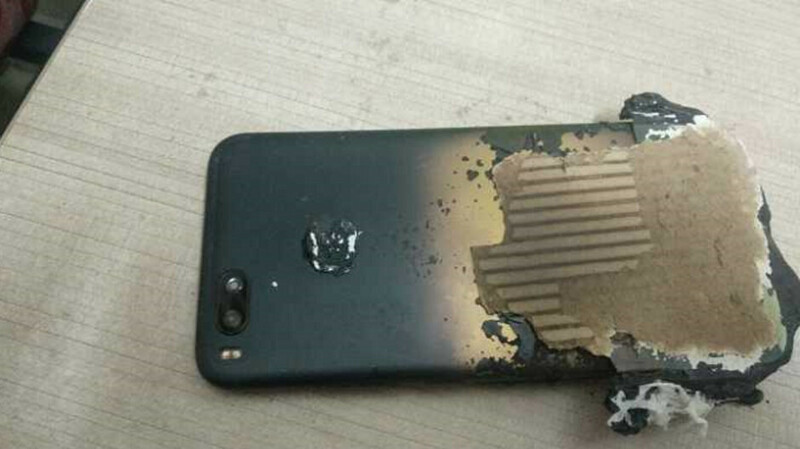 A message sent into an official Xiaomi website revealed a story about the author's friend, whose Mi A1 exploded while he was charging it overnight (see image at the top of this article). The owner of the phone was jolted out of his sleep by something that he couldn't pin down, and so he went back to bed. In the morning, he found his handset destroyed. The picture that accompanies this article shows how lucky the guy was not to have had his face by the device when the incident took place. In addition, the phone was in some sort of protective case, which minimized the impact of the blast. As for the Xiaomi Mi A2, the news here is not as dramatic, but still not good for owners of the unit. It seems that the phone is having issues with its 3010mAh battery; those sporting this model are finding that their handsets are running out of power much earlier than they should be. The problem apparently traces back to the fingerprint scanner on the Mi A2. Using the biometric reader to unlock the device somehow gets all eight cores on the Snapdragon 660 Mobile Platform running at max speed. That leads to the quick death of the battery, reducing screen-on time to three or four hours. The phone features a 6-inch LCD screen with a 1080 x 2160 resolution (aspect ratio of 18:9) and is equipped with 4GB/6GB RAM and 32GB/64GB/128GB of native storage. Even though several Mi A2 owners have presented evidence that the fingerprint sensor is responsible for the poor battery life, Xiaomi posted on a bug report that it "needs more information." Considering that the original complaint dates back over one month, it would behoove Xiaomi to issue some sort of statement soon. Oh ! Fortunate that he had the case on ! But another line of thinking could be that the case did not allow for effective heat dissipation , which caused the explosion in the first place. Anyway Xiaomi should not use this as an excuse and carry out full investigation. Compensate the user if proved at fault too. It doesn't looks like it explode, more like overheat. It's really hot that it melt the case and stuck it in a cardboard (stuff that picture really looks like a cardboard), usually if battery explode it's just went puff and make a bit of smokes, but no prolonged heat. It's hard to trust Chinese wares in all honesty. Not only suspect in software, but hardware too. Almost Forgot, then some vendors load on their own nefarious wares before you get it. Good luck! The fact the phone is made IN China shouldn't be an issue. Asian goods are all cheaper to make there vs here or wherever here is for you. Batteries and overheat and explode. I mean I've had calculator batteries explode before. Millions of phones one has an issue. Same with Samsung. They sell over 300M phones in a year, and when just one catches fire it's a big deal. When Apple has this issue it's a big deal. This stuff happens. It doesn't have anything to do with cheap labor. Xiaomi. Ales quality products failures will happen. Exactly, It's just one in a million case, there are tiny possibility for something like this to happen, the more smartphones they sell, the bigger number of faulty devices. And Google is in charge on the software side, since both of these phones are Android ONE. So Samsung explode, Apple explode, Google explode, Microsoft explode and now Xiaomi explode, with Huawei as a rising star, I am expected to see the news which reporting exploding Huawei devices.